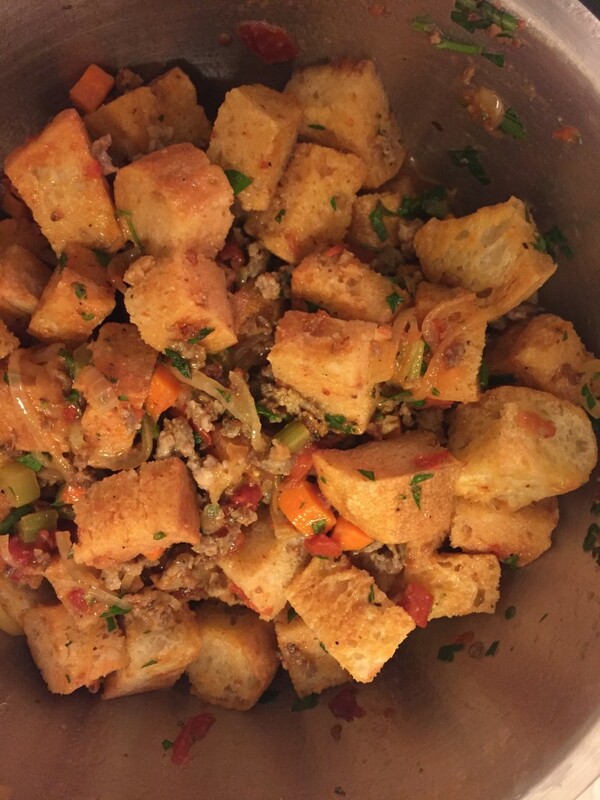 For such a simple recipe, this ciabatta and sausage stuffing packs a ton of classic Thanksgiving flavors and will make for the perfect leftover breakfast or brunch. 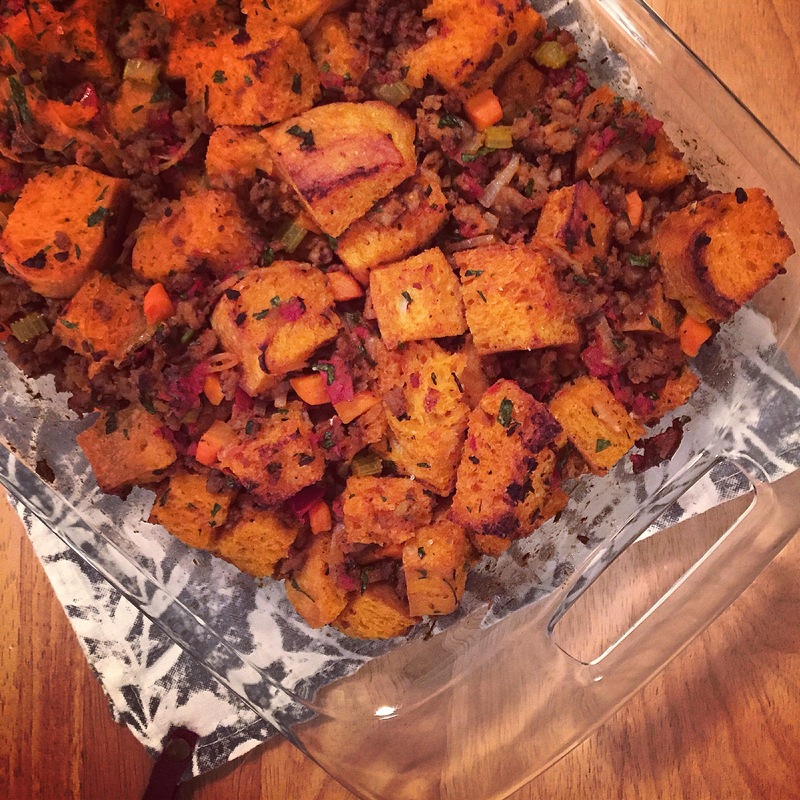 Note: While I know the stuffing vs. dressing debate hits home for a lot of us, I’m going to ask for forgiveness while I refer to this technical ‘dressing’ (because it’s made outside of the turkey) as stuffing. Stale bread is key. Day-old ciabatta is best, as the slightly stale bread will better soak in the moisture and flavors you’ll add. If you’re impatient like I am, you can buy fresh ciabatta and toast it in the oven for about 10 minutes while the sausage browns. Don’t forget the secret ingredient. While shopping for sausage, I got an awesome tip from one of the butchers (who happens to be a former chef) at my local Whole Foods. He suggested adding a can of fire roasted tomatoes to my recipe. It sounded nontraditional but intriguing, so I went for it & I am so glad I did. The tomato flavor is subtle and absolutely does not take away from that classic Thanksgiving stuffing flavor I was hoping to achieve. The tomatoes add a bit of acidity to cut through the hearty ciabatta and fatty sausage while keeping the entire dish moist and flavorful. Check for moisture. Stuffing is notorious for drying out during the cooking process so it’s important to have additional turkey or chicken stock on hand. This recipe’s secret ingredient should prevent this from happening, but it’s good to be prepared! 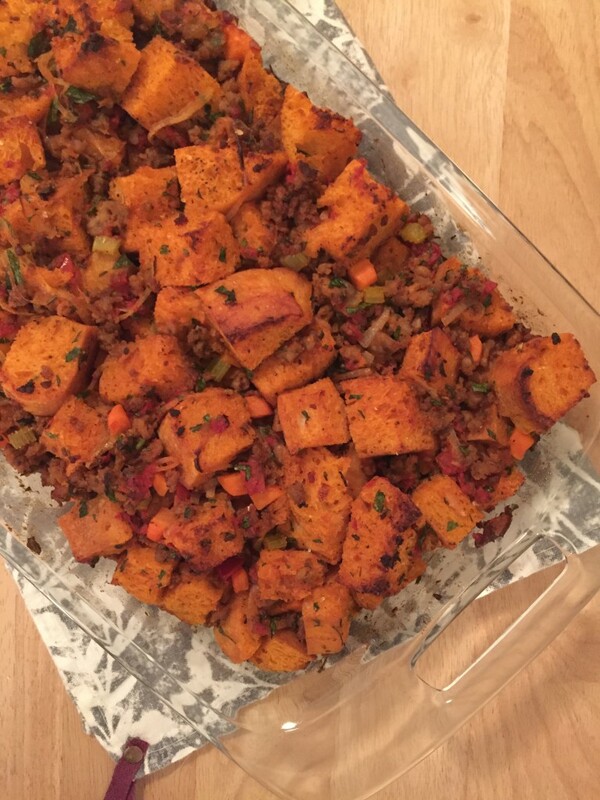 Half-way through the cook-time, check to ensure your stuffing is moist – I simply touched the top and listened for that wet sound we all tend to cringe at. If you feel like it may be drying out, add 1/4 to 1/2 cup of stock then return to the oven to finish cooking. This will give you the golden crisp top and tender center you’re looking for. 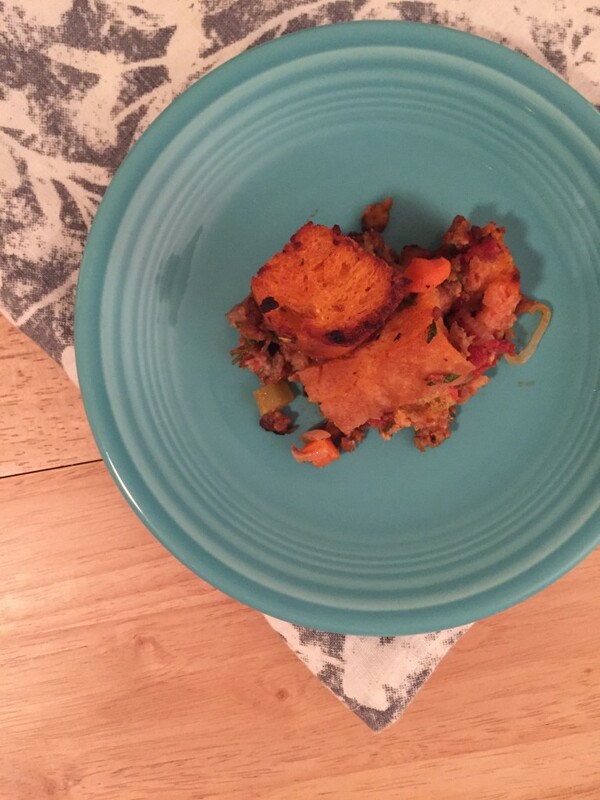 Leftovers mean breakfast or brunch the next day. 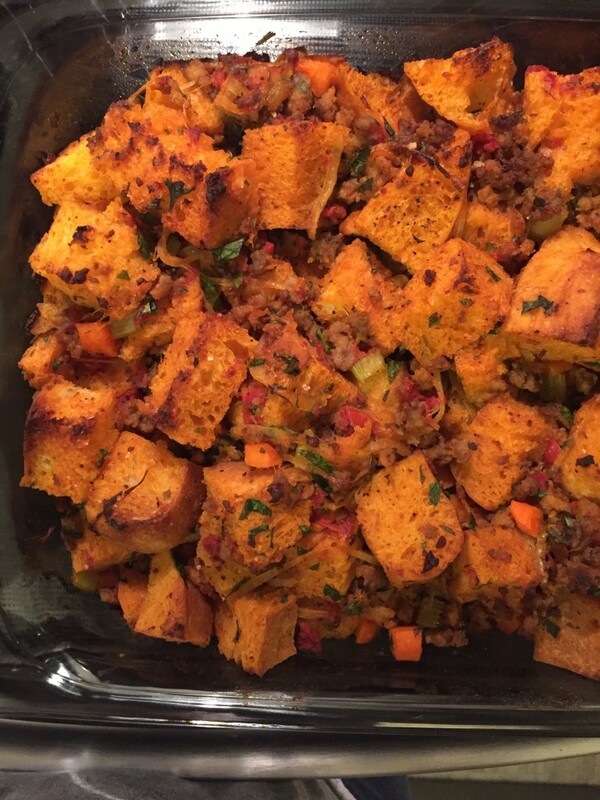 Like most things, this stuffing is delicious warmed with an egg on top of it. My preference would be poached or over-easy, so the stuffing can soak up the deliciously runny egg yolk. 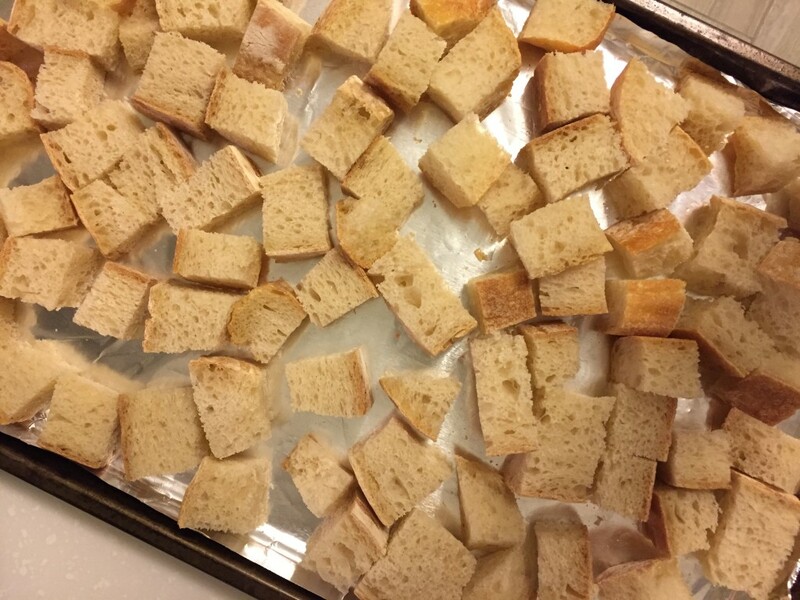 If using fresh ciabatta, toast the 1-inch pieces in the oven while the sausage browns, 10-12 minutes. Once toasted, remove and set aside. Melt 1 tablespoon of butter in a large skillet over medium-high heat. 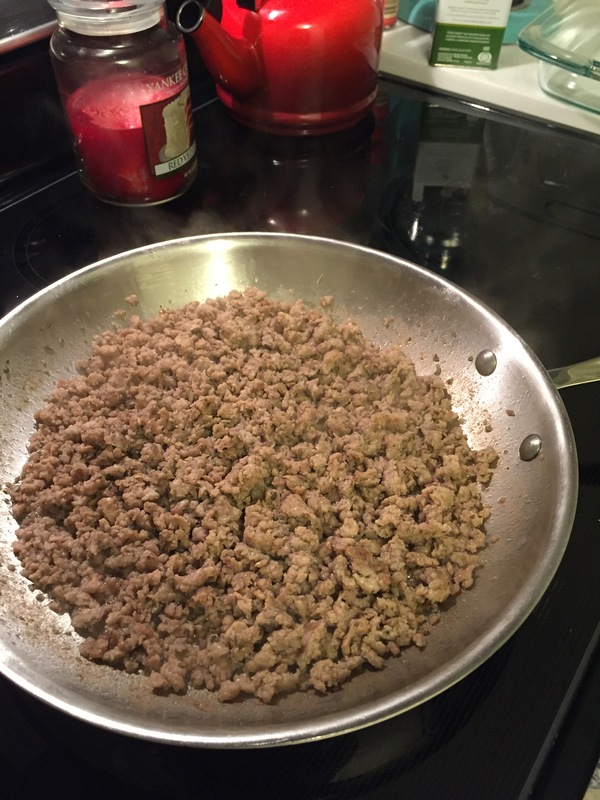 Cook the sausage until browned, stirring and breaking up the meat into small pieces, 10-12 minutes. 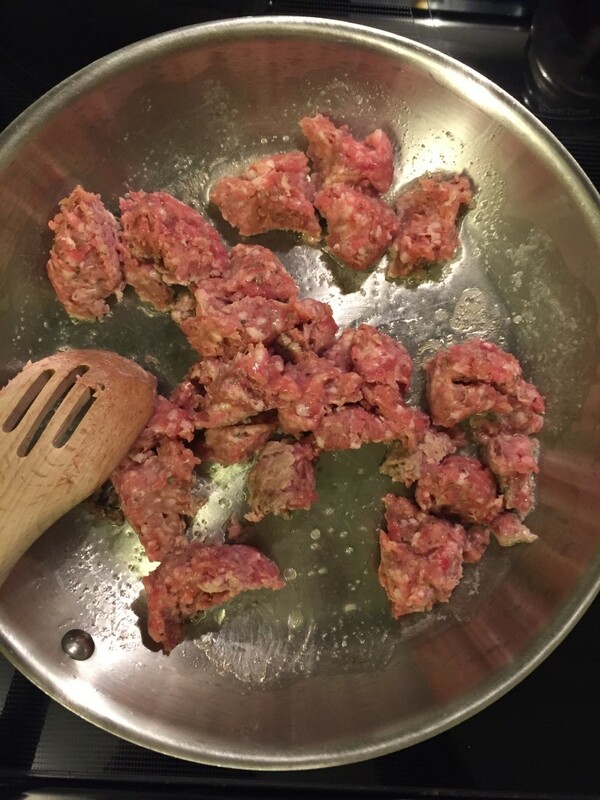 Using a slotted spoon, transfer the browned sausage to a very large bowl and set aside. 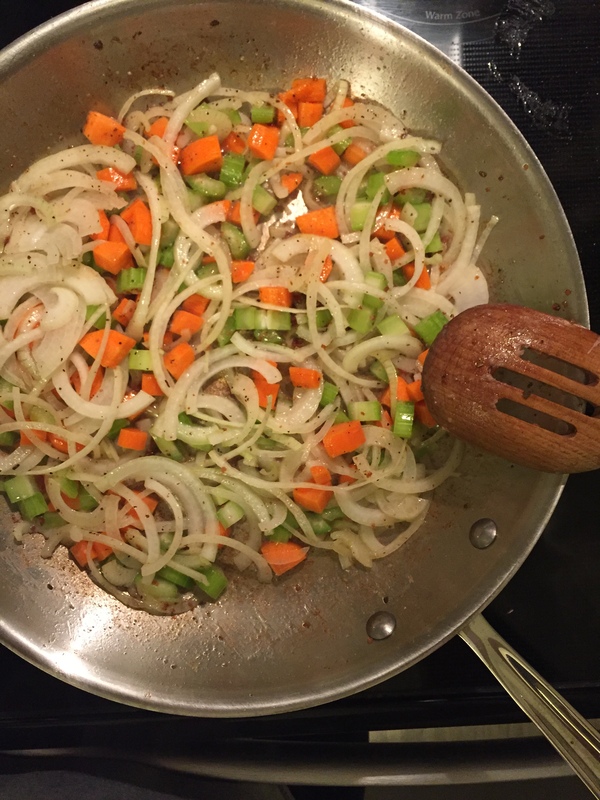 Add the remaining 2 tablespoons of butter, plus the carrots, celery and onion to the skillet. Cook until vegetables are tender, 8-10 minutes. 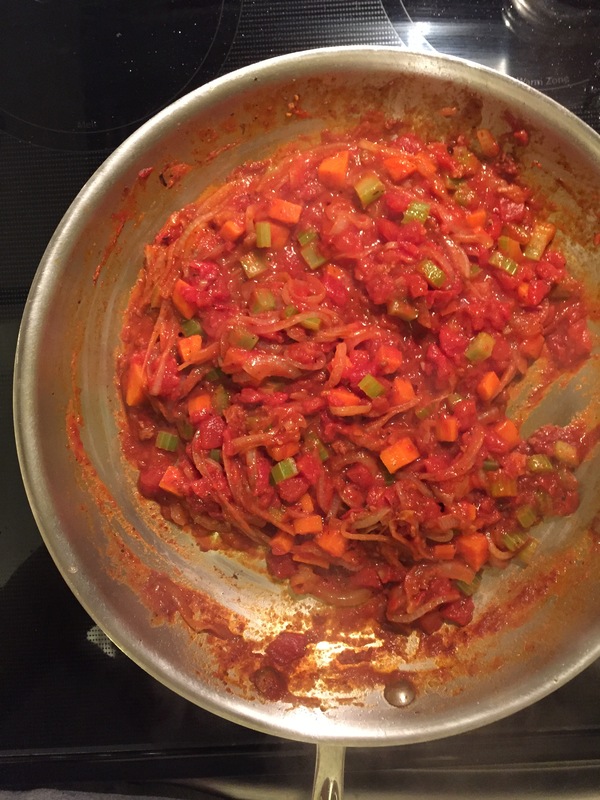 Add the canned tomatoes and cook until mixture thickens, 3-5 minutes. Transfer the vegetable mixture to the sausage and add the stock, EVOO, fresh herbs, ciabatta, salt and pepper. Toss to combine. Transfer to a 9x13 baking dish and spread evenly. 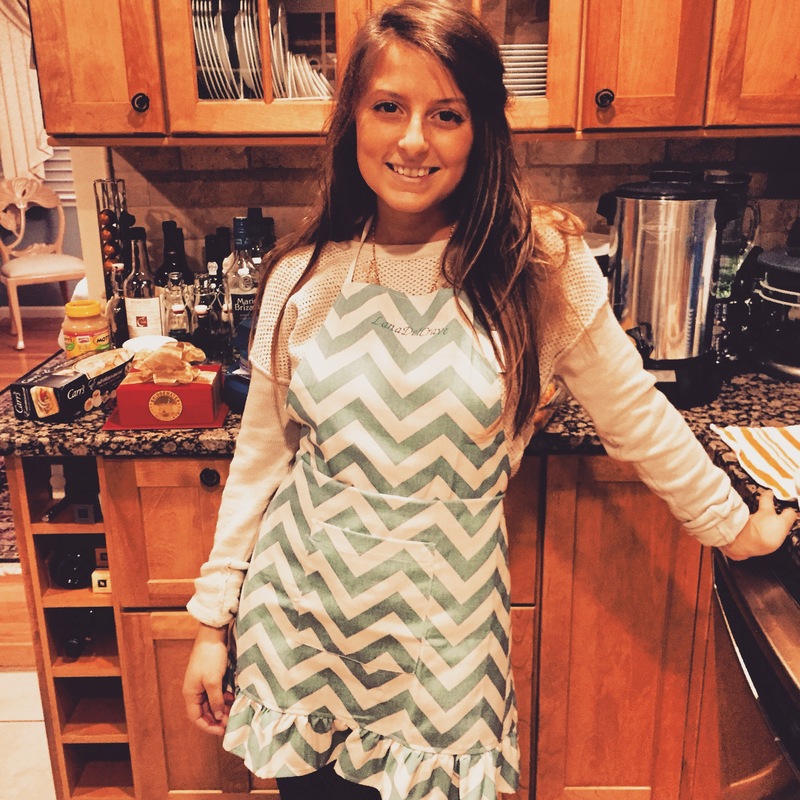 Bake in the preheated oven until the top is golden brown and bread is slightly crisp to the touch, 30-15 minutes. 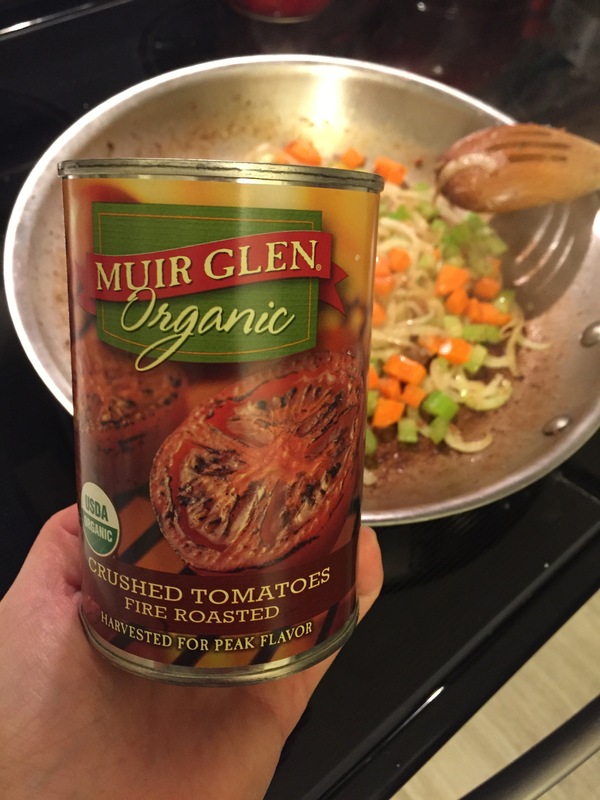 Try to buy fire-roasted tomatoes in cans that are BPA free. Tomatoes are highly acidic so they draw out the BPA typically found in cans and most plastic products. Ingesting BPA can cause a list of health problems, so it's best to ensure your tomatoes are packaged in a can sans BPA. I typically use the Muir Glen brand.